Sergeant, R.A. Barracks, Ipswich (1908). On 1 September 1914, at Nery, France, during a fierce attack by the enemy, all the officers of 'L' Battery were either killed or wounded, including the officer (Edward Kinder Bradbury) in command, who, although having had one leg taken off by a shell, continued to direct the firing until he died. 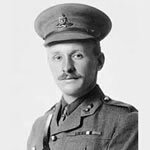 Battery Sergeant-Major Dorrell then took over command with the support of a sergeant (David Nelson) and continued to fire one of the guns until all the ammunition was expended.